Several people have asked for this recipe that I received from a good friend. Chocolatey friends are the best, no? For me, this is best served a day afterwards, microwaved almost to the point of melting the chocolate chips. Beat together all ingredients, adding chocolate chips last. 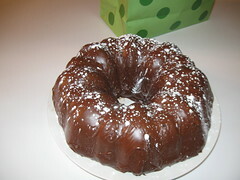 Pour into a well-greased bundt cake pan. Bake at 350 degress for 1 hour. I received this recipe that works for turkey and chicken from a co-worker of mine and it is delicious. Mix up the marinate good, then add fowl. Marinate for 24 hours — I like to marinate for a couple of days, and have for 5 or so. If you use chicken and/or marinate for more than 24 hours, lay off the garlic a little.